Description:Used 2010 Jeep Grand Cherokee Laredo for sale - Call with 134,404 miles. 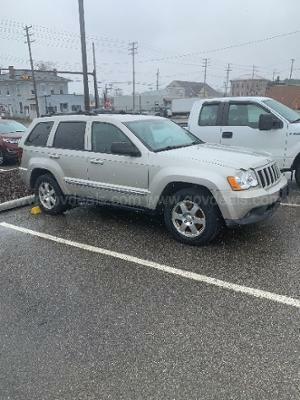 Online Auction for Government Surplus – QAL # 6401-30 - Ends 4/29/19 **PRICE REFLECTS CURRENT HIGH BID AND IS SUBJECT TO CHANGE AT ANY TIME DURING THE ONGOING AUCTION** 2010 Jeep Grand Cherokee Laredo 4WD SPORT UTILITY 4-DR, 3.7L V6 SOHC 12V. Runs well Heat, air, and all options work. One key fob needs battery - other key fob ok Was a police vehicle, when mobile radio was removed, the stereo antenna was not replaced. Antenna is inside the jeep. GovDeals.com is the online auction platform where you can bid on and buy government surplus. Description:Used 2017 Kia Sportage LX for sale - $16,995.00 with 38,964 miles. 2017 Kia Sportage LX It has a 2.4 liter 4 Cylinder Engine high output engine. This small suv has an automatic transmission. Front wheel drive on the Sportage gives you better traction and better fuel economy. This Kia Sportage is equipped with a gasoline engine. It has an elegant black exterior finish. Anti-lock brakes will help you stop in an emergency. Light weight alloy wheels on this vehicle are the perfect compliment to a stylish body. See what's behind you with the back up camera on this model. This vehicle features cruise control for long trips. The Sportage looks aggressive with a streamlined rear spoiler. The vehicle is built for driving comfort with a telescoping wheel. It features tinted windows. Description:Used 2018 Kia Soul + for sale - $14,595.00 with 41,744 miles. 2018 Kia Soul + Recent Arrival! This Kia Soul is Herrnstein Hyundai Certified unit, meaning it has received a meticulous 124 point inspection and receives a 3 month 3,000 mile powertrain warranty. 2018 Kia Soul Plus I4 6-Speed Automatic with Sportmatic FWD Please call Herrnstein Hyundai today at to schedule your test drive and experience the Herrnstein family difference. Description:Used 2018 Kia Soul + for sale - $14,968.00 with 41,231 miles. 2018 Kia Soul + Recent Arrival! This Kia Soul is Herrnstein Hyundai Certified unit, meaning it has received a meticulous 124 point inspection and receives a 3 month 3,000 mile powertrain warranty. 2018 Kia Soul Plus I4 6-Speed Automatic with Sportmatic FWD Please call Herrnstein Hyundai today at to schedule your test drive and experience the Herrnstein family difference. Description:Used 2013 Kia Forte5 Ex for sale - Call with 62,620 miles. 2013 Kia Forte5 Ex Why buy from Classic in Madison? We offer a large selection of pre-owned cars, trucks, vans and SUV?s; specializing in Certified Pre-Owned vehicles from General Motors, Chrysler, Dodge, Jeep and Ram.We are located East of Cleveland, we have a professional and knowledgeable Sales Staff, our Management Team is one of the best in Lake County and if you have had credit challenges in the past, give one of our Business Manager?s a call at|they will be happy to assist you. We look forward to meeting you and earning your business! Description:Used 2014 Kia Rio LX for sale - Call with 48,061 miles. 2014 Kia Rio LX The vehicle has a 1.6 liter 4 Cylinder Engine high output engine. The high efficiency automatic transmission shifts smoothly and allows you to relax while driving. This 2014 Kia Rio is front wheel drive. This vehicle is equipped with a gasoline engine. This Kia Rio embodies class and sophistication with its refined white exterior. Anti-lock brakes will help you stop in an emergency. Icebox AC keeps the vehicle cool all summer long. Keep yourself cool in the summer with the premium quality tinted windows. Description:Used 2018 Hyundai Ioniq Hybrid Blue for sale - $18,995.00 with 16,823 miles. 2018 Hyundai Ioniq Hybrid Blue Stock Number: K23621A, VIN Number: KMHC65LC4JU065650, Style Name: Hatchback Blue, Make: Hyundai, Model: Ioniq Hybrid, Model Year: 2018, Type: Hatchback, Vehicle Trim: 5DR BLUE HATCHB, Exterior Color: CERAMIC WHITE, Body Type: Hatchback, Interior Color: Beige, MPG Manual City: 57, MPG Manual Highway: 59, Engine Description: 1.6L I4 16V, Fuel Type: Hybrid-Electric, Fuel Induction: Gasoline Direct Injection, Valves Per Cylinder: 4, Aspiration: Normal, Driven Wheels: Front-Wheel, Transmission: 6-Speed Manual, Wheels Rims: Aluminum, Drive Train Type: FWD, Independent Suspension: Four-Wheel, Stabilizer Bar: Front, Clock, External Temp, Low Fuel Level, Tachometer, Trip Computer, Front Wipers: Variable Intermittent, Privacy Glass: Light, Rear Defogger, Antenna Type: Window Grid, Audio System: Siriusxm AM/FM/HD/Satellite, Speakers: 6, Drivers Height: Manual, Passenger Height: Manual, Seating Capacity: 5, Front Seat Type: Bucket, Upholstery: Cloth, Folding: Fold Forward Seatback, Center Console: Full With Covered Storage, Cruise Control, Cupholders: Front And Rear, Door Pockets: Driver, Passenger And Rear, Overhead Console: Mini With Storage, Power Outlets: 2, Seatback Storage, Steering Adjustment: Tilt And Telescopic, Steering Power: Speed-Proportional Electric Power Steering, Power Mirrors: Power Remote, Power Door Locks, Windows: Power Windows, Air Conditioning: Automatic, Air Filtration: Interior Air Filtration, Trunk Lights: Cargo Area Light, Center Console Trim: Piano Black, Reading Lights: Front, Shift Knob: Urethane, Steering Wheel Trim: Urethane, Vanity Mirrors: Dual Illuminated Vanity Mirrors, Bumpers: Body-Colored, Door Reinforcement: Side-Impact Door Beam, Turning Circle: 34.8, ABS: 4-Wheel, Head Airbags: Curtain 1St And 2Nd Row, Anti Theft System, Brake Assist: Braking Assist, Safety Locks: Manual, Daytime Running Light, Engine Immobilizer, Headlights Auto Delay: Auto Delay Off, Headlights Dusksensor: Dusk Sensing, Front Headrests: Manual Adjustable, Rear Headrests: 3, Rear Center Seatbelt: 3-Point Belt, Safety Stability Control, Driver And Passenger Airbag, Side Airbag, Stability Control, Rear Door Type: Liftgate, Side Door Type: Conventional, Front Head Room: 39.1 Inches, Front Hip Room: 53.8 Inches, Front Shoulder Room: 56.1 Inches, Front Leg Room: 42.2 Inches, Rear Head Room: 37.4 Inches, Rear Hip Room: 52.9 Inches, Rear Leg Room: 35.7 Inches, Rear Shoulder Room: 55.0 Inches, Luggage Capacity: 27 Cu.Ft., Length: 176.0 Inches, Width: 71.7 Inches, Height: 56.9 Inches, Wheelbase: 106.3 Inches, Ground Clearance: 5.3 Inches, Max Gross Vehicle Weight: 3,935 Lbs., Curb Weight: 2,996 Lbs. Description:Used 2014 Subaru Xv Crosstrek Hybrid Touring for sale - Call with 102,221 miles. 2014 Subaru Xv Crosstrek Hybrid Touring Why buy from Classic in Madison? We offer a large selection of pre-owned cars, trucks, vans and SUV?s; specializing in Certified Pre-Owned vehicles from General Motors, Chrysler, Dodge, Jeep and Ram.We are located East of Cleveland, we have a professional and knowledgeable Sales Staff, our Management Team is one of the best in Lake County and if you have had credit challenges in the past, give one of our Business Manager?s a call at|they will be happy to assist you. We look forward to meeting you and earning your business!